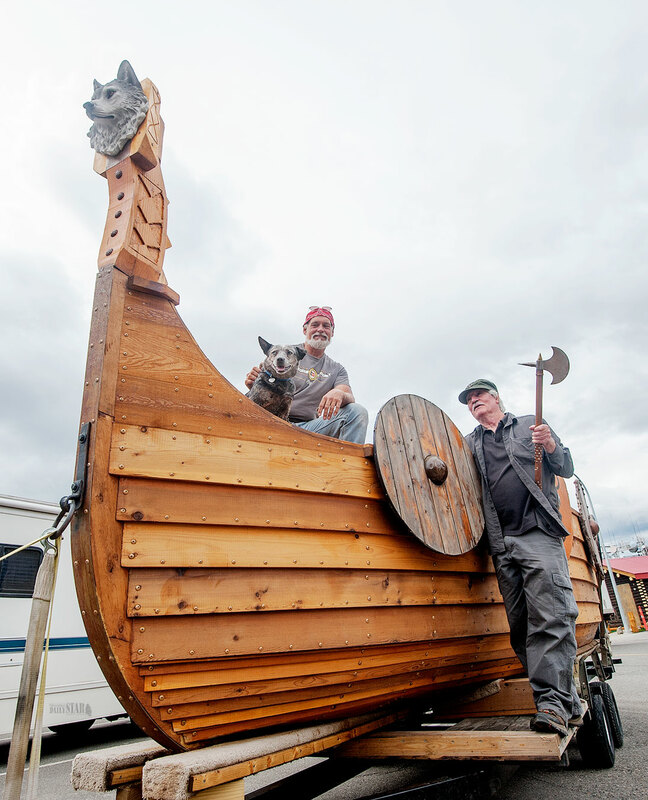 DESTINATION: DAWSON – Reed Bernie, left, and Brad Caldwell, along with Blue, will soon take their Viking-inspired ship to Dawson City. They are seen Tuesday afternoon in downtown Whitehorse. For anyone who’s ever dreamed of joining the crew of a Viking-style long boat plying the Yukon River, of all places, it may be their lucky day. Reed Birnie and Brad Caldwell are hoping to find a few crew members as they make their way from Whitehorse to Dawson City in the Codahnagi, the Viking-inspired boat they’ve built for the adventure. They have a couple of days to pick up supplies, find some volunteers to be part of the crew and work out logistics like having the vehicle and trailer they’ve driven from Tennessee delivered to Dawson. They’re hoping to get the boat in the water on Friday, likely from Rotary Peace Park. The boat was parked outside the downtown visitors’ information centre Tuesday afternoon. It drew more than a few visitors wanting their pictures taken beside the river vessel, which took Birnie, Caldwell and a few other helpers about three months to build. It’s not the first time Birnie has come into the territory with a Viking-inspired boat, ready to tackle the Yukon River. Thirteen years ago, he made the same journey after a canoe trip with his dog prompted him to think about obtaining a bigger boat for such long journeys. The bigger boat was his first Viking-like boat – Valkyrie (which means “Warrior Maiden”) – that started out from Lake Laberge and made its way to Dawson in 2003. “This is the new and improved model,” Birnie told the Star with a laugh. His old boat just wasn’t up to the task of another long-distance journey, he added. The vessel is named after his dog Codahnagi (meaning friendly spirit), who was on the last trip down the Yukon with Birnie. The new boat features a replica of Codahnagi’s head, on the boat’s bow stem honouring the dog. It also comes complete with Viking paraphenalia, from the Viking axes to head gear modeled after what the Vikings would have worn. This time around, Birnie’s dog Blue will be part of the entire journey with his girlfriend, Amy Jones, also joining the crew in Carmacks. Birnie, Caldwell, family members and friends gave the Valkyrie a traditional Viking send-off – a balfore or funeral by fire – shooting flaming arrows into the sail and watching it burn. Birnie has travelled the Yukon River many times over the years as the “lure of the Yukon” continues to bring him back. For Caldwell, this trip will be entirely new territory, featuring a vessel he doesn’t normally adventure in. His past adventures, he explained, have involved navigating up more mountains than waterways. The one long-distance river trip he has taken saw him end up lost in a swamp in South Carolina, he said. After meeting Birnie a few years ago and hearing his tales of travelling the Yukon River, Caldwell was anxious to join in such an adventure. As he said, he’s always wanted to travel to Alaska. His interest in that found him reading about Dawson and the Yukon, so he told Birnie that should he ever travel in the territory again, he wanted to tag along. At 75 years old, Caldwell said, now is the time for him to do it, especially after his doctor deemed he was in good shape to make such a journey. He laughed as he recalled his daughter flying in to see him and check on his will after he told her of the plans. That’s how Caldwell described towing a massive 27-foot hull longboat along highways, including the Alaska Highway. He’s been taken with the beauty of the land, from the fields of wheat in the prairies to the mountains further west and the twists and turns of the Alaska Highway. “It’s just awesome,” he said. He certainly learned his heart was in good shape as they made their way along the highway to the Yukon and Whitehorse. “You didn’t hear me screaming (from the highway)?” he quizzed those who had gathered to see the boat at the visitors’ centre Tuesday. Among those who came to take in the longboat and greet the visitors were deputy mayor Betty Irwin along with a number of city officials. 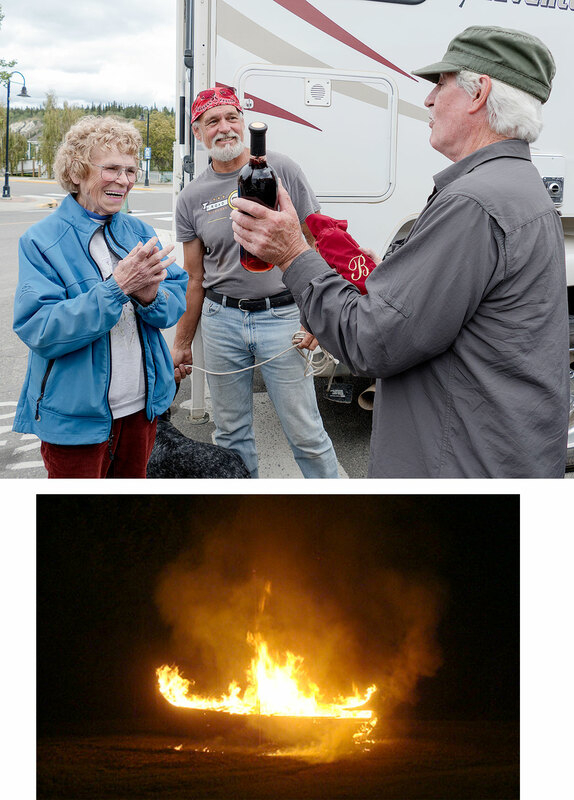 Caldwell, who makes wine and spirits in his free time, presented the city with a couple of bottles of his red wine. “Be careful with that, Betty; it’ll make you lively,” he jokingly warned. Caldwell also has a couple of bottles packed away to present to the officials in Dawson. As well, he’s carrying a bottle of spirits for one of the staffers at the visitors’ centre there who’s been helping him and Birnie plan the trip. The pair expect to spend about 20 days on the river before coming into Dawson, though there are no deadlines set in stone. If they want to take an extra day here or there, they can, the pair said. Anyone wanting to be part of the journey as a crew member for the entire journey or just part of it can find the pair at Robert Service Campground over the next couple of days before they leave. As well, they can be contacted via their Facebook page at The Codahnagi Yukon Adventure. The Facebook page can also be used to follow their journey. My brother and I met these interesting folk and their Viking craft while canoeing on the Yukon in 2016. Long may the spirit of adventure, typified by these "Tennessee Vikings", live. A beautiful adventure. I salute you. I'll be following your journey. Great stuff. Pretty much the coolest boat in the Yukon. A Viking invasion of Dawson sounds like fun. Imagine OJW, if everyone took one of those simple low cost DNA test that told one about where all their ancestors were from on this globe. It would be a wake up call for many to find that they are more blended than they think (or act). You can pick your friends but you can't pick your DNA. Wow, like really wow! To think we are still allowed to reflect on white culture, and the Vikings even...AND get press time doing so? Good job crews, Floki would be proud. But seems to be white and have pride in your roots, gets you a hate charge these days in this engineered socialist state we fund...that I suggest hates us so so much. May you have fair winds and thanks for coming.